Using a worm compost bin, also called vermicomposting, is an easy and efficient way to recycle food scraps into an excellent fertilizer for your houseplants and garden. By composting some of your household waste in a worm bin, you can reduce the amount of garbage you send to the landfill. Another advantage of worm composting is that it can be done indoors and outdoors, allowing for year round composting. Get a worm compost bin. A 2 foot by 4 foot by 1 foot bin works well for a two or three person household. The bin can be made of wood, plastic, or metal. It should have a tight-fitting lid, bottom drainage holes and catch tray, and air vents on the top and sides. Add moist bedding to the bin. Good bedding materials include newspaper or cardboard cut into one-inch strips, leaves, peat moss, or coarse sawdust. Put 1-2 pounds of red wiggler worms into the bin. You can get the worms at a bait shop, through mail order, or from a friend with a worm bin. Red wigglers multiply quickly. Don't use earthworms. Bury food waste in the bedding. To prevent odor, bury waste several inches deep and add only enough food that you notice worms can eat in a few days. Bury scraps in different places in the box each time. Keep bedding moist and fluffy. Harvest compost every few months. To harvest, push bin contents to one side of the bin and put fresh bedding on the other side. Continue to bury waste on the fresh side only. 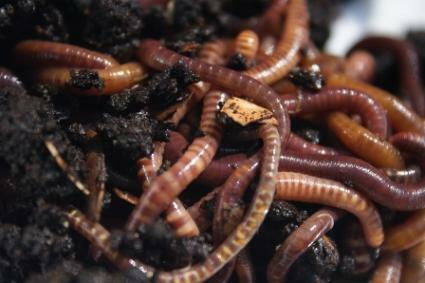 Over the next several weeks, the worms will migrate to the fresh side, and you can remove the compost from the other.